I have been hooked with Imortal for over a month now. When the TV series started last October, I decided to check the just first week how it will be presented. 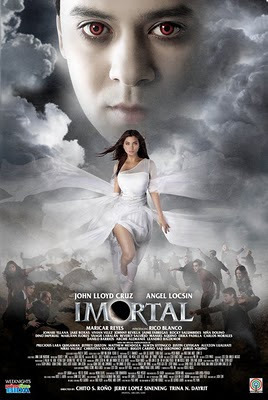 It is a spin-off series of Lobo which also stars Angel Locsin. I thought that ABS-CBN joined the bandwagon of foreign vampire oriented TV series. Maybe they did go ride the vampire series craze like True Blood and Vampire Diaries, but with the series under the direction of Chito Roño, this is one great series to be anticipated. Based on what I have watched, it seems the Lobo's (Werewolves) are native to this country while the vampires came from foreign lands as early as Spanish era. As the story goes, the two warring races of vampires and werewolves still have opposing faction within them. With the vampire race divided into 2 groups, one who wants supremacy against the human race led by Magnus (Jake Roxas) and Samantha Imperial (Maricar de Mesa) and the other group which has learned to control the thirst for human blood led by Roman Rodriguez (Jomari Yllana). On the Lobo's side, which has already established a community within humans is currently divided into people who supports the current 'Punong Bantay', Lucille Zaragosa (Vivian Velez) and the other group who believes Lyka Ortega, Lia's (Angel Locsin) is not a traitor to the werewolves' race. Upon watching it for 2 weeks, I noticed some similarities from other famous vampire shows and movies. One good example is the vampire's ability to walk in daylight possibly due to solution with sunblock properties. The concept is very similar from what the enemies from Blade (movie) apply to be able to walk in broad daylight. Samantha's birth shares similarity with the Blade's birth from the movie version wherein their mother was bitten during their pregnancy. This concept showed a great difference from Mateo Rodriguez (John Lloyd Cruz) since he is born from a human mother and vampire father which makes him unique among the other vampires. One thing that needs improvement are the CGI's of the werewolves. I am not sure our local artistic technology needs boost or what. Right now, my schedule prevents me from watching the series, but thanks to the power of internet and video streaming, I will be able to catch the past episodes. Hopefully the plot won't go down as compared to how it performs at present. Ako din I watched Lobo from start to finish. I loved the story. Pero yung Imortal ndi ko na nasundan. Sayang.